*If you would like more information or to buy tickets for any of the events please speak to Sharon Tuner. Multi Sports Summer School 2018 is over now and many thanks to all the children who attended and we look forward to seeing you again in the Summer School 2019. On Sunday we play in the Lichfield Sunday League we will be competing in the division 1 in 2019. Alex Smith for Ladies cricket on 07801 594125. From mid April, there is often a Junior or Ladies match taking place on a Monday, Tuesday or Wednesday evening, starting around 6.00pm- 6.30pm. Senior matches take place every Saturday start at 1.00pm. Sunday Junior matches start at 10.00am and Seniors and Ladies at 2.00pm. Please check the website fixtures for further details. We are an ECB Club-mark and Focus Club which means we are recognised as being child friendly and provide a safe environment for children to play cricket. We have several coaches to help plan, coach and develop the skills men and women, girls and boys and at all age groups and of all abilities. All of our coaches are ECB qualified and certified by the Disclosure & Barring Service (DBS). Milford Hall CC works closely with our Pyramid Schools and the local community to provide a facility not only to play cricket but for other functions too. After the founding of the Milford Hall Ladies team in 2012 the section has gone from strength to strength. Currently they play in division 1 of the West Midlands Cricket League, also playing in softball tournaments throughout the year, both outdoors and indoors. The Ladies train on a Monday evening from 6.15pm onwards, for ages 12+ and all abilities are welcome. 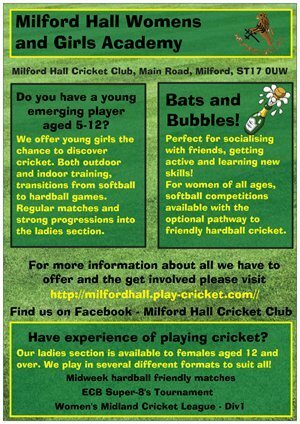 The Milford girls section is a flourishing part of our cricket club, after recently completing the first indoor season playing in the U11s girls league the girls play in mixed age group cricket throughout the summer with opportunities to compete in girl’s festivals to aid and support their development as budding cricketers. Milford's Junior Section is highly regarded throughout the county with many members going on to achieve County or District representative honours. Milford Junior sides have regularly enjoyed success in County Cup and will compete in the Staffs Moorlands League during 2018, offering league cricket at 5 different age groups from Under 8s to Under 16s. Training in the summer is for the Under 13 & Under 15 age groups on Tuesday evenings from 6.30pm. The younger age groups train on Friday evenings from 6.30pm. The Club is situated in the beautiful village of Milford in Staffordshire on the edge of Cannock Chase, overlooked by the magnificent Milford Hall.